I am very privileged to be able to not only pamper myself in the most beautifully created products made from wonderful natural ingredients but I can also share this with my clients. As a practising beauty and complementary therapist, I often work with products that have been sent to me by the kind members of Fresholi. These products often stimulate new ideas for treatments/methods of application. After being sent some lovely products recently, I decided to work on a foot pampering treatment and thought it would be a good idea to let members see how the products are being used and what sort of results can be achieved. Chamomile and Apricot Buttercream – by Ruth (see above). Containing apricot butter, healing calendula, vitamin E, arrowroot and Roman chamomile essential oil (very soothing and healing – perfect for sore, cracked skin). Normally I would begin a pedicure with a foot bath but occasionally, I void the foot bath if the skin on the feet is particularly dry and flaky – treatment, in my opinion is, much more effective (although if the skin has become thickened, then a foot bath is very much indicated). As you can see, my client’s feet were dry quite dry (especially around the heels) with only small, isolated areas of thickening and in this case, I began treatment without bathing. After wiping over the feet with antiseptic, I began removing the dry, flaking skin using a foot file. First working with the course side of the file and finishing with the finer side. I am not sure whether it shows clearly enough here but this part of the treatment generates an awful lot of fine powder (in which case a face mask is indicated). Next I began exfoliating with the wonderful scrublets. 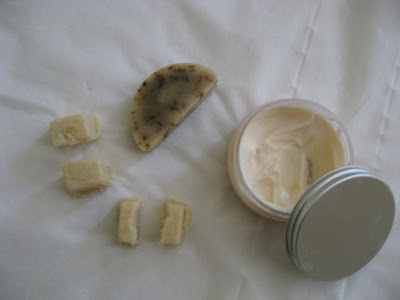 I first warmed the scrublet in the palms of my hands to melt the butters and turn it into a kind of paste. I then applied to the whole of the foot and the lower leg in circular motions working from the extremities towards the heart, paying particular attention to the dryer, flakier areas. This was a real dream to work with. The sugar crystals and almond grounds spread so evenly and exfoliation was both gentle yet stimulating to the blood circulation. I then enveloped the feet in cling film to help the lovely butters and oils penetrate more efficiently. I then wrapped the feet together in a warm towel (I kept them together to help maintain warmth). Notice that I left the toes free to allow me to continue working on the nails and cuticles, first the nails are clipped…. After about 10-15 minutes, I removed the wraps from the feet and at this point, they looked positively drenched in lovely emollient oils/butters and felt so incredibly soft. Using dry cloths in sweeping downward strokes, I removed the excess scrub particles and then cleansed the feet and lower leg using the rosemary soap (with its lush, creamy bubbles and wonderful fresh scent). I removed the soap using hot cloths. I then began massage with the lovely, aromatic chamomile and apricot butter cream which is an excellent massage medium for the feet. With its light creamy texture, healing and moisturising properties it provided enough slip to complete the massage but was both penetrative and non-greasy. The skin felt just divine afterwards. As you can see, the result is just excellent. The feet look revived, moisturised and the flakiness remedied. ith a touch of polish the feet look transformed from dry, tired-looking feet into totally rejuvenated, show me the dance floor feet. Brilliant!! Although there are a few things I may change to the general application routine, to fine-tune it, the products were just wonderful to work with, very effective and made for a lovely, pampering treatment for my client. My client was thrilled with the treatment and remarked how soft and comfortable her feet felt. My sincere thanks to my lovely client, Elaine and Ruth for their incredible kindness for sending me such lovely, quality products that are (as always) a joy to use and work with). Wow! I never thought to use my own products on my pedicure clients! What a good idea Helen, thank you! You are most welcome Charlie :o) I use lots of products on my client and they, of course, are more than happy about it. I think in this case, there are a few things I would like to develop in terms of really luxing up the routine (make it an experience) but it is so satisfying using lovely products made by hand with loving care and lashings of natural goodies. Thanks C. I think the products used would really help in between treatments. Those having regular pedicures usually come every six weeks (some more often than that) but if the client had a lighter product to use at home, it would certainly help to maintain and further improve the dryness and prevent the skin from cracking.